AFRICANGLOBE – Sometimes, I think we ought to dedicate Black History Month to reviewing the part about Black pride. I say this because these days, it seems that a lot of us either missed that chapter or just decided to skip it altogether. I’m sure when the Godfather of Soul sang that, he was referring to skin color as well as attitude; that he was challenging us to counteract a universe where blackness was something to be either cursed or marginalized, and blondness and whiteness was something to be exalted. Which brings us to today; to a time in which more Black people seem to be using their money or their fame to look whiter, rather than use it to make people appreciate their blackness. I hate to see that despite their success, they can’t manage to love themselves enough to not drastically lighten their skin, or sharpen their noses, or do other things that, in the end, will wind up making them look more cartoonish than Caucasian. 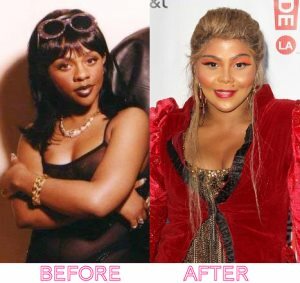 I wince, for example, for Lil’ Kim. Her brown skin and petite, impish look was appealing, but now, her severely lightened skin and botched plastic surgeries make her barely recognizable. Then there’s Nicki Minaj, with her bleached blonde hair and a complexion that looks a heck of a lot lighter than her high school graduation photo. And judging from before and after photos posted on rolling out.com, Trina McGee from “Boy Meets World,” looks like she could now check White on the census form. Dominican baseball star Sammy Sosa’s complexion has long since faded to white, while Jamaican artist Vybz Kartel, who looks like a tattooed ghost, says he plans to market his own brand of bleaching products, saying it’s no different than White people tanning. But tanned White people have never been banned from using bathrooms and water fountains, while Black people have been denied access strictly for being Black. Since that’s no longer the case, it seems an exercise in self-hatred for any Black person who isn’t correcting a discoloration to want to bleach his or her perfectly nice skin to look more like the White people who denied their forebears that access; that on some level they still view their darkness as an aesthetic flaw. Worse, a dark-skinned fan claimed on Bossip that when she asked him about using that lyric when his daughter is brown-skinned, he said that his daughter was a dark-skinned millionaire, and that made all the difference. So what Lil’ Wayne is saying is that being rich will enable his daughter to survive the defect of being dark. What a horrible lesson to teach a child. You also have magazines that can’t manage to feature Beyonce, or Rihanna, or Halle Berry on the cover without making them look several shades lighter. And you see it in the Black youths and children who are exposed more to rappers and celebrity culture than they are to Black history. I’ve encountered Black children calling each other Black as an insult – something that should have stopped ages ago – which means between the insults, the magazine covers and the Lil’ Waynes – a lot of dark-skinned children may grow up hating themselves. So maybe a good part of Black history ought to deal with Black pride. Maybe we should revive that James Brown song so that skin bleaching doesn’t pick up speed as a trend, and that dark-skinned Black people don’t lose sight of the fact that their color is something to be celebrated, not shunned. It’s sad that the bleaching celebrities probably won’t learn from this as well – especially since they have the power to use their fame and money to revel in their Blackness instead of trying to escape it. And wind up encouraging other Black people to do the same. Tonyaa Weathersbee is an award-winning columnist based in Jacksonville, Fla. Follow her @tonyaajw. Or like her on Facebook at www.facebook.com/tonyaajweathersbee.